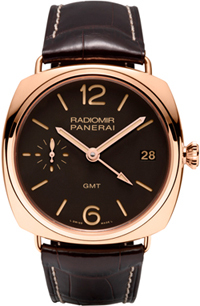 The elegance of rose gold as an ideal complement to the classic body Radiomir 3 Days GMT Oro Rosso – new model watchmakers Officine Panerai, which uses a draper mechanism with manual winding P.3001. Skilled factory has made a deep and warm colors for the 47 mm red gold case (5Npt) through the use of a special alloy with a high copper content and the addition of platinum. This not only adds the charm of a classic body, but also increases its resistance to corrosion. This deep color creates a harmonious and sophisticated combination with classic brown dial “sandwich” design, which ensures perfect legibility in any environment thanks to luminescent material Super-LumiNova ®. The three-day power reserve indicator shows the transparent back cover, which also allows you to look at the progress of the exclusive mechanism established watchmakers manufacture Officine Panerai. Manufactory caliber P.3001 has the functions of date and second time zone, as well as the reset seconds hand and a quick clock. The latter function allows you to transfer hours in increments of one hour, without disturbing precision of the hour with the minute hand. Radiomir 3 Days GMT Oro Rosso delivered on a brown alligator strap. Movement: mechanical with manual winding. Exclusive caliber Panerai P.3001, 16,5 lines, thickness 6.3 mm, 21 jewels, balance Glucydur ®, 21,600 pcs / hour. Shock protection Incabloc ®. Power reserve 3 days, 2 winding drum, 210 parts. Functions: Hours, minutes, small seconds, date, second time zone, power reserve indicator, seconds reset function. Case: Polished 18K red gold, removable arch strap (patented). Screw-down crown with logo OP. Diameter of 47 mm. Bezel: Polished 18K red gold. Crystal: Sapphire, made from corundum, 1.4 mm thick. Anti-reflective coating. Water resistance: 5 atm. (~ 50 meters). Strap: Panerai Corporate strap alligator with a big buckle in polished 18K rose gold.